Interior Designers Institute is a boutique college, specializing in teaching interior design and interior architecture. The college’s specialized curriculum, offers each student a personalized education with student-focused faculty, who love teaching. IDI’s mission is to be an exclusive producer of interior design graduates, who become some of the most well-known and successful designers in the country. Interior Designers Institute was founded in 1984 in Corona del Mar, California. The steady growth of the college can be attributed in part to its reputation for excellence, the need for a high caliber private college and its location in the heart of Orange County, California. Orange County is unique in terms of affluence, progressiveness and overall acceptance of the importance of interior design. 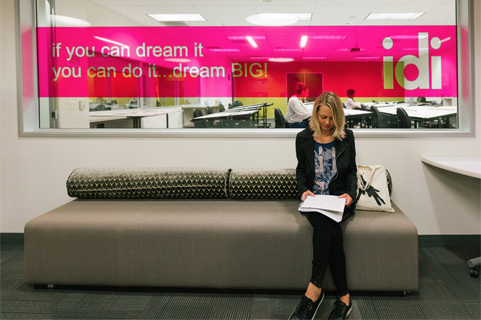 Design opportunities abound in the area, which has a multitude of interior design firms, as well as its own design center, Laguna Design Center. It is also in close proximity to the Pacific Design Center, one of the largest in the country. These factors have had a profound influence in framing the Institute’s progressive approach to education and its job placement. As a small, progressive college, the Institute has been able to adapt to design changes and trends. It has recognized the importance of active participation and involvement in the major interior design professional organizations, and maintains student chapters of ASID and IIDA. In 1990, the Institute moved to larger facilities in Newport Beach, California, offering additional classrooms and expanded student areas. From the beginning, the emphasis at the Institute has always been on high educational standards. This was made possible by a faculty comprised of leaders in the design field, progressive classes and placement services. The Institute has maintained an atmosphere of personal attention. This standard of excellence is the Institute’s commitment to its current and future students as well as to the design community.